My salary this month was a little higher than usual as it included the £360 Health Rebate from work for my gym membership. Instead of just saving half of it, I’ve invested all of it, which has enabled me to get an all time high savings rate of 56.3%! Woo hoo! The amount saved was also boosted by £20.07 from Inboxpounds*, £1.25 win from Searchlotto, £33.37 mortgage protection premium refund I mentioned earlier in the month, £6.13 reviewing music on Slicethepie* and £100 rent received. My average savings rate is now at 46.19% – I’m not going to hit my target average of 50% as I’m unlikely to save over 80% in December but I think I’ve made a good attempt in my first year of saving/investing. I’m quite confident I’ll hit that target next year! Speaking of goals, one of my goals for 2014 was for the value of my investments portfolio to reach £22,000. As of today, the value of my investments was £23,902.56! Sorted :-)! 25% was spent on meat or fish and 25% was spent on fruit and veg, so better on the fruit/veg front compared to last month. Still spent 11% on snacks so need to continue to work on that! I’ve already been spending more than usual (on my credit card) as is typical for this time of year. While I’m being quite generous buying things for friends and family, I’ve resisted the urge to buy a single thing for myself…so far! I’m not going to abstain completely, but whatever I buy, it’s not going to be anything expensive, unlike some gifts I’ve bought for myself in the past! Black Friday came and went without me buying a thing, I just didn’t feel like getting caught in all the hype and madness. Perhaps I’ve missed some great deals, but perhaps I haven’t. I’ve got a day off work tomorrow to do some actual shopping in the high street – I reckon I won’t last very long before I get fed up and go home! This entry was posted in Budget, Expenses, Portfolio, Savings by weenie. Bookmark the permalink. Hope you have a productive day's shopping tomorrow. I hate this time of year from that point of view, although I love most things about Christmas. That feeling of panic when you realise time is running out and you still have to think of something to buy for x, y and z… Horrible. Not the real spirit of gift giving at all. You have some really encouraging news there, well done! First of all, great effort for saving/investing 100% of the rebate. 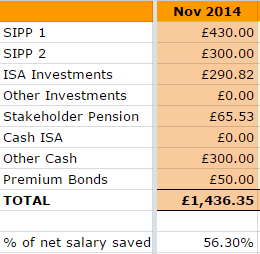 It took me a bit of time to get used to saving 100% of lump sums I received. Did it feel good for you? Congrat's on the all time high saving rate. That's closer to 60% than 50%. I see you hitting 60% at some point next year, and I totally agree with you on hitting 50% for 2015. I would put money on it! Congrat's once again on your Portfolio total. £1900 over target is 8.6% higher than your initial Goal and you have a month to go. You must be pleased with that! Well done on hitting your weekly grocery shopping target of £25. Another goal set and hit. What a roll you're on! Thanks for sharing the good news. I'm really pleased for you, and you left me very motivated! I hope you enjoy your day off tomorrow. And congrats for crossing the £22,000 mark! Yep, it felt really good to save the whole rebate amount – I've never done that before, it's always just gotten spent in the past! I'm really chuffed with that savings rate and in fact, your vote of confidence may see me setting myself a target to try to achieve 60% at least once next year…that'll be a very tough one! I am very pleased with my portfolio total, especially as it means I get to rejig my FI calculation – something to ponder over after Christmas! Thanks very much for the words of support. Thanks Cerridwen – I'm going to set myself a tougher target next year, push a bit harder! I was reminded today that shopping for me is a chore, not something to really enjoy. I appear to have spent quite a lot of money but still didn't manage to buy everything I needed to get. I headed off home after 2 hours of frustration and bought the rest of my stuff online… Still got some things to get but at least I've started. I know what you mean, I'm not feeling the spirit of giving at all, on the verge of bah humbug to be honest, haha! Hi NMW, thanks – it's a great rate for me, but still a way to go to reach the dizzy heights of your savings rate of >70%! Unfortunately, December isn't going to look so good – that's a fact I know already! Thanks! 30 or 40 % is still a great figure – I just need to push for 50% (or more if I can) because I've started pretty late with my savings/investment plan so need to make up for lost time! My pension isn't huge – it's possible that I could live on it but not to the lifestyle that I'm used to, hence my own personal savings/investments. Agree – best time is to shop after Christmas, less crowds too! Congratulations on passing your portfolio goal, and resisting slashing out on Black Friday…..I got carried away and bought a diary! Saving almost 50% of your salary is fantastic, and I don't get near to that, or spending only £25 on food, so well done. 2015 should be a great year, and now you have got a good base to build from the dividend income should provide a fillip to keep feeding the dividend monster. I hope that I will be able to maintain my savings rate and the food budget – it's not going to be easy but I'm going to give it a good go. Thanks for the kind wishes and all the best to you too for the build up to Christmas! Congrats on the 56% savings rate, it's brilliant. To gain more perspective, most "normal" people consider not being overdrawn at the end of the month a massive achievement, so 56% is ridiculously good. Food shopping – the discounters (Lidl, Aldi) are awesome. I'm spending about £80pm (my half, split between two). It also encourages more cooking from scratch which is always a good thing. I do get fed for free at work though, which helps. A special laugh at Financial Independence UK for getting whipped up in the Black Friday hype and splashing out on a diary! I wouldn't consider going near Black Friday unless armed with an Uzi and a Flamethrower. Agree shopping is a chore, and I prefer online too. I hope you get the rest of Christmas prep sorted and it's fun and enjoyable. Well done on the 46% so far this year, and for keeping us all motivated. Hi Starla, thanks. 56% is a one off, although technically, as I get that rebate every year, I should be able to hit it at least once a year! Prior to discovering this PF/ERE blogging community, I thought I was doing 'great' by not being overdrawn every month! I shop at Tesco and Aldi – can't just shop at the latter, as it's only a small store near me so doesn't have everything I need. Do you have your own blog? Have read several of your comments on other blogs which have interested me and would love to read more about how you are doing! Hey Starla, FANTASTIC! That's great news about you starting your own blog as I would be most interested in your background and in your FI journey! Yes, I see many similarities between us and I hope to learn from any differences that we have! Sorry if I have commented twice. The internet hates me tonight. Your savings rate is amazing. I can't even come close to that – but I am working on it. Your food budget is so tiny! I could use some pointers. Congratulations on hitting your investment goals. I hope 2015 is just as good. Hi May, just the one comment that I can see! Thanks, I'm very pleased and encouraged that I have hit my investment goals – perhaps I set them too low but it's my first year – 2015 will be tough but like you say, hopefully just as good! +1 for a blog from Starla… I would be interested to hear more of your story as well! Great going with the savings %age this month weenie. I fear December will be a low savings month for most so nothing to get defeated about, as has been mentioned even saving anything in December is a helluva lot better than most people are doing at this time of year. Let's all pat ourselves on the back and have a glass of mulled wine shall we?! Hi TFS, yes, looking forward to Starla's own blog! Thanks and I agree, saving anything in December will be an achievement, except that things have gone a bit wrong for me this month, which I shall post about shortly…. It's getting chilly these days so yes, a bit of mulled wine (or spiced cider) will do nicely!